For those of you who’d like to sail in a single-handed boat after leaving the optimist class you could try out the laser. It is also a single sail boat and has 3 interchangeable sails and rigs – 4.7, radial and full rig, to cater for all sizes of sailors. The 4.7 is the smallest of these rigs. The Laser is suitable to sail from young teenagers to adult. If you want to pleasure sail or enjoy racing against others this could be the boat for you. As there are 3 rigs, they are all handicapped differently so when racing you have a fair chance of beating someone else who’s racing in a full rig if the conditions and experience are in your favour! 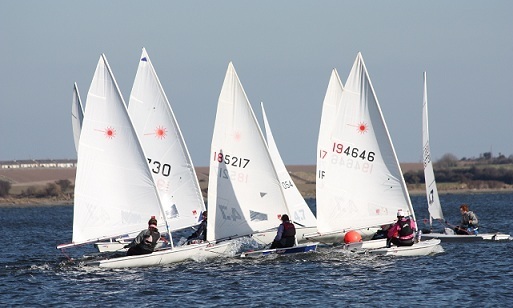 Our junior sailors compete on the circuit as in the optimist class the laser class hosts Ulster, Munster, Leinster, Connaught and National events yearly. When racing in these events you sail against your own rig-type. Lasers are possibly the most common dinghies sailed today resulting in an abundance of boats available. If you know of anyone with a laser lying idle in a garden do not hesitate to advise them it could be put to better use. We have some hulls sailing in Skerries aged 30 years plus so they are a good investment and looked after they last a lifetime. 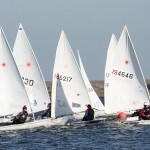 The Laser fleet welcomes beginners, improvers and experienced sailors. In Skerries we have training and club racing by experienced coaches throughout the year.